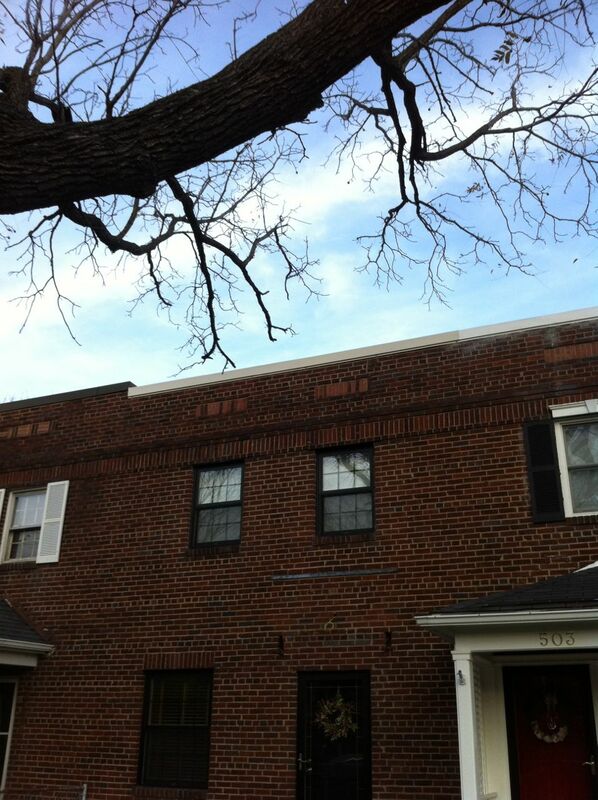 We do a lot of these flat roof row house in Alexandria, VA, my reference list for flat roof row houses is well into the 150’s. 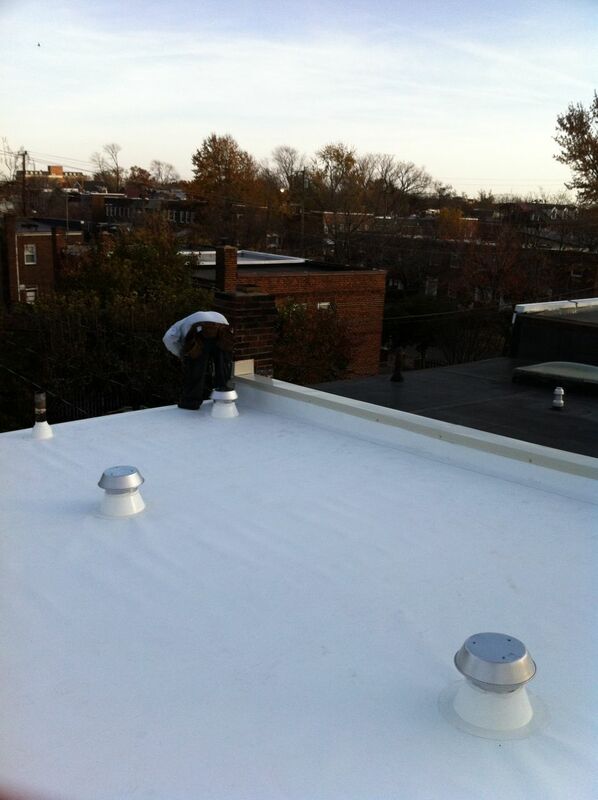 We’ve come up with a system of re-roofing that typically has the whole job done in a day, this speed and efficeincy allows us to offer a superior roof at an incredible value. I’ll show you the steps we take: Click on any picture to enlarge. Tear off the old roofs: To be sure that the roof deck is sound and there is no rot we remove all of the old roofing down to the wood decking. 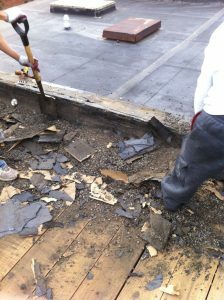 We replaced a few boards on this house but overall the wood deck was in great shape. You can see the two layers of roofing in this shot; an extra layer of roofing can add another 2500 pounds to a roof, it can also hide a leaking roof when water accumulates between the layers of roofing. Two layers of roofing on this flat roof row house. Next we install new polyisocyanurate insulation board over the entire roof; this will give a smooth surface to lay our new roofing on and give some great R value to the roof. 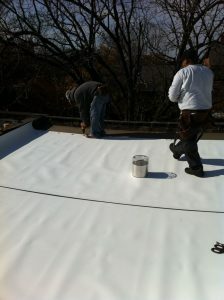 The insulation will help keep the upper floors a lot cooler in summer and a little warmer in winter. 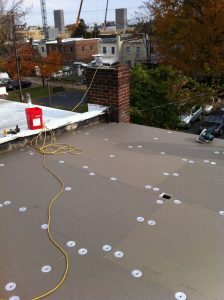 The insulation is fastened with epoxy coated screws and insulation fastening plates; the plates give more surface are to the screw head and securely fasten the insulation to the roof deck. 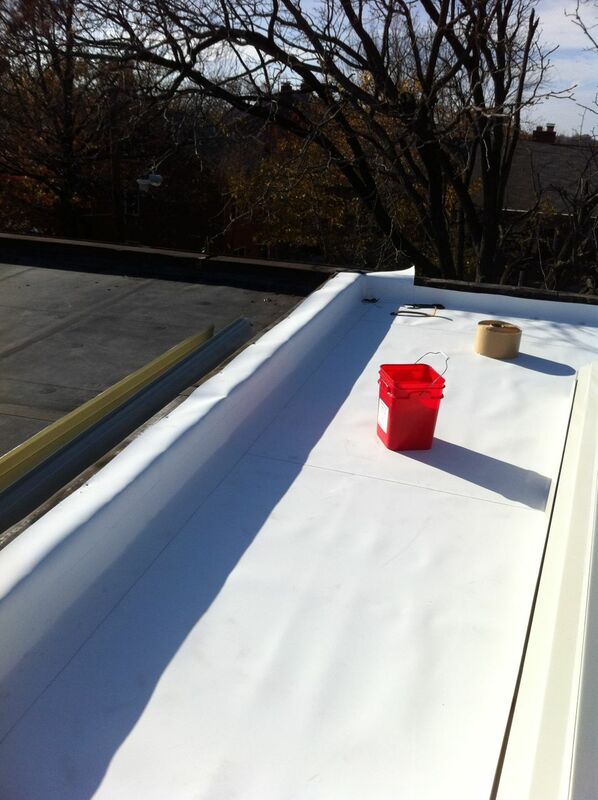 Now we are laying out the membrane across the roof, the TPO membrane is secured with the same screws and smaller seam fastening plates. Each successive course of TPO membrane overlaps the area where the fasteners hold the membrane in place. 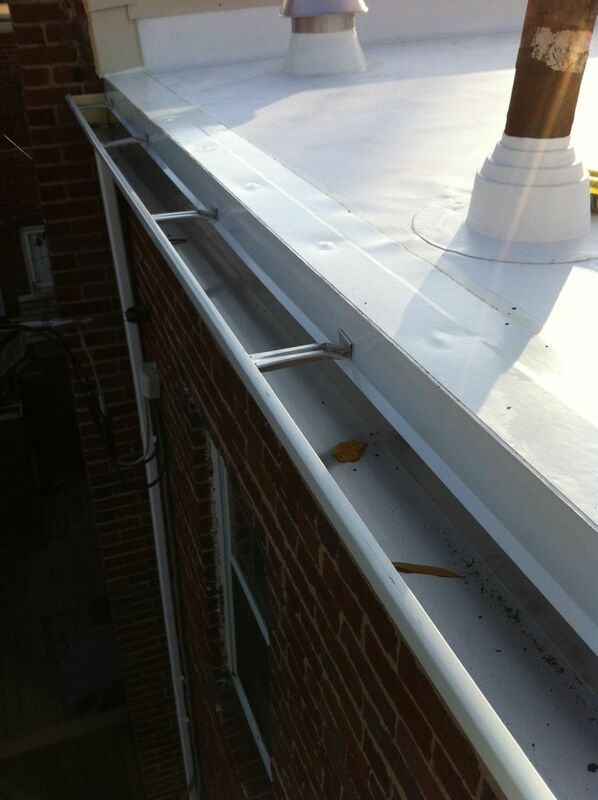 We also replace all of the vents on the roof, we never leave anything on the roof that could cause a problem in the future; the vent in the center is a fresh air vent for the attic, the cap and flashing for the vents are installed after the roof deck membrane is installed. 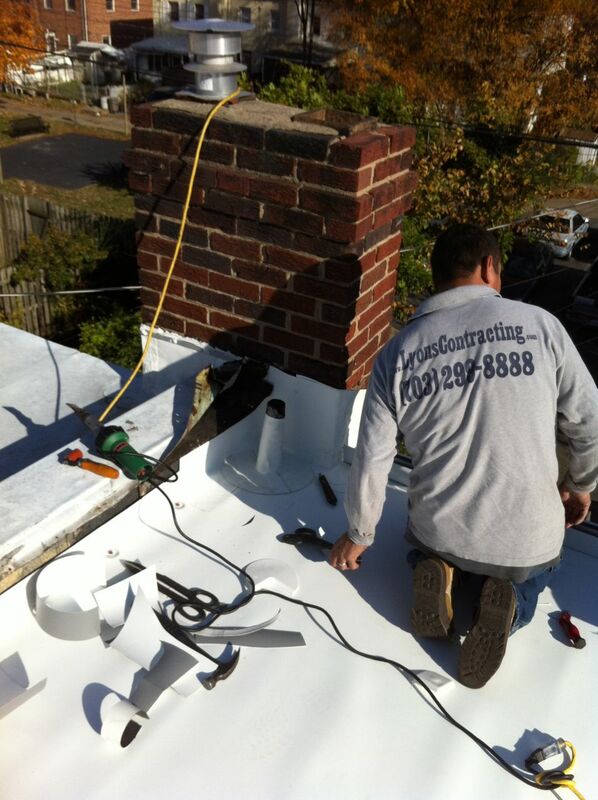 The green and black tool is a hot air welder, it is used to safely heat the membrane to bond all of the seams and flashings; the welds are as strong as the material itself and they require no adhesive or maintenance. This shows the flashing for the vent and the vent cap are installed. The seam in the TPO roof membrane is also welded, the seam is hard to see but the snips (big scissors) are pointing at it. The membrane is fastened at the walls with the same seam plates and screws; TPO must be secured with screws and plates at any angle change or transition. 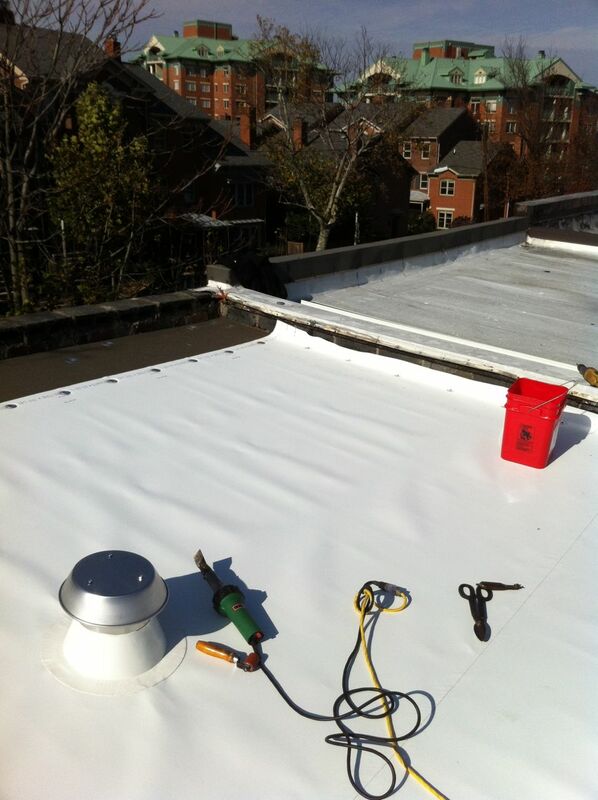 The screws and plates at the wall are covered with another layer of TPO membrane, this flashing covers the parapet dividing wall and waterproofs the perimeter of the roof; the TPO wall flashing is then welded to the roof deck membrane. Compare to the picture above and you’ll notice that no fasteners are visible and the entire detail is crisp and completely waterproof. 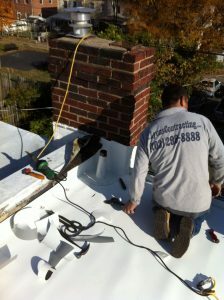 We had to make small pipe flashing for this plumbing pipe in the corner by the chimney. 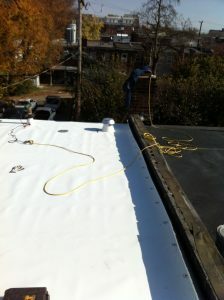 TPO is a very versatile material, we can weld it an any imaginable shape to waterproof any roof feature. 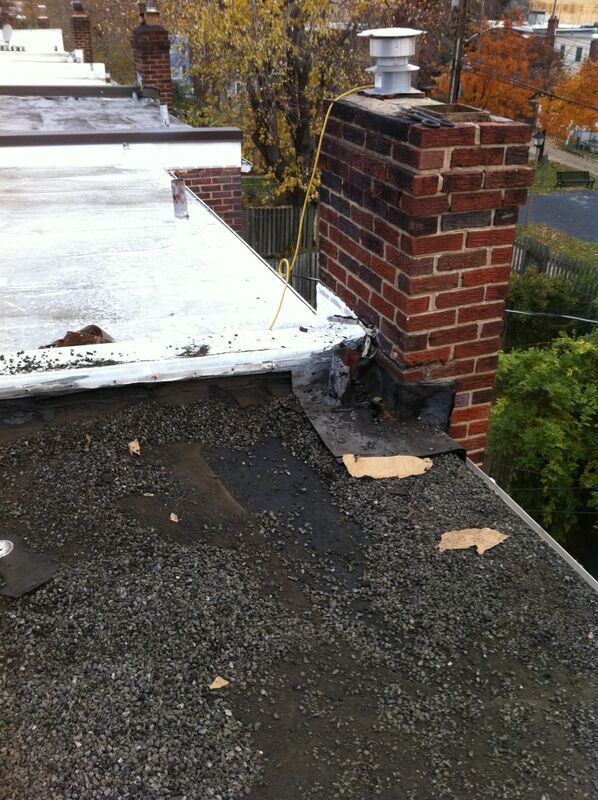 The previous eave detail had water spilling behind the gutter, the misdirected water caused the facia to rot away. 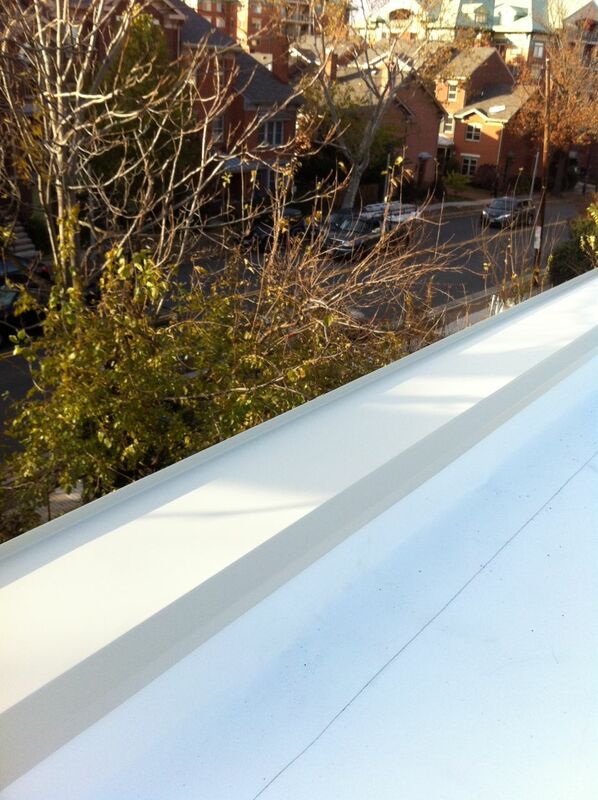 We installed a new gutter and made new longer drip edge to ensure that the rain water moved swiftly from the roof straight into the gutter. To finish the job I made new wall coping to cap the parapet wall; my client chose Almond, the old coping was rusted white. 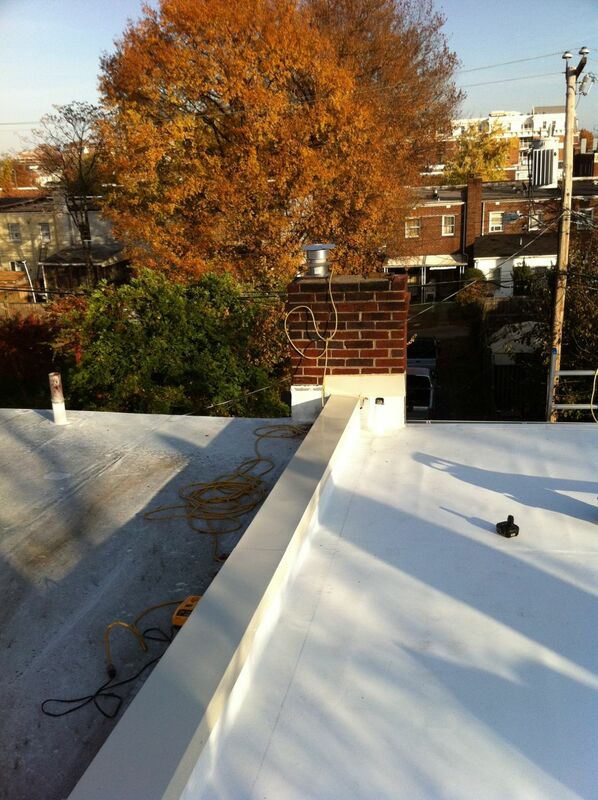 This new coping is fabricated from pre-painted aluminum, the finish will last for at least 30 years and the aluminum will never rust; this reduces maintenance costs and keeps the job looking great. The front wall coping was fabricated with a small vertical section to keep water from rolling over the face of the house. All done: I wish the pictures were better but the only way to get a picture of the whole roof at once would be to climb a 30′ tall tree. 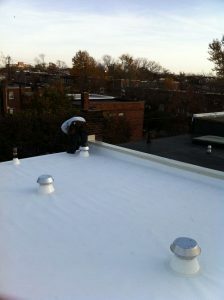 All this roof will ever need is a yearly gutter cleaning and it will last a very long time. Energy Star rated TPO will take a major burden off your air conditioning by reflecting the suns rays in the summer; most of my clients report that they no longer feel the 15 degree rise in temperature as they walk up the stairs in the summer. 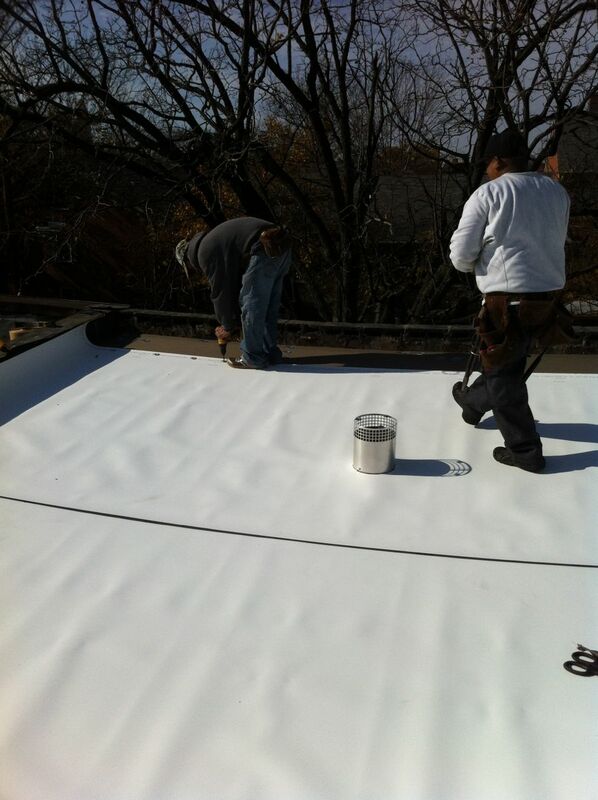 I personally work on every TPO job- I weld all the seams and flashings and absolutely ensure that the roof is perfect in every way before we leave. This last picture is the front of the house.